Our gift to PHS will be outdoor tables and seats for the student seating area in front of the school. Cost of per set is $700. Please feel free to contribute any amount. 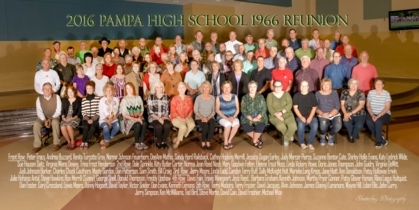 Welcome Pampa High School Classmates of 1966! Hi Class of 1966 - please see below the thank you from Steve Martin and PHS Principal, Hugh Piatt. Thank you Steve Martin, who so graciously stepped up and communicated with the school for their needs, and made all the arrangements for purchasing and delivery of our gifts and name plates. And from Ken McWilliams, a huge "thank you" to all the Classmates of 1966 who contributed so generoulsy and willingly to give back to our wonderful alma mater. are a terrific addition to our campus and the kids are utilizing them daily! like you and your classmates, is truly special. To play the video, click the large green play button in the middle of the video. To make the video fullscreen, hover over the video and click the rectangular icon on the green bottom bar.